Original 1920's brick warehouse building centrally located around the corner from Whole Foods and the new Apple store, and 3 blocks from the Bedford L train. We offer flexible shooting hours including pre-dawn, late-nights and weekends. 1,800 square foot, white-brick gallery on the first floor features 15' ceilings, 13' drive-in garage, grey concrete floors, and gallery lighting. Included is a small outdoor patio and a kitchen with a fridge & oven. 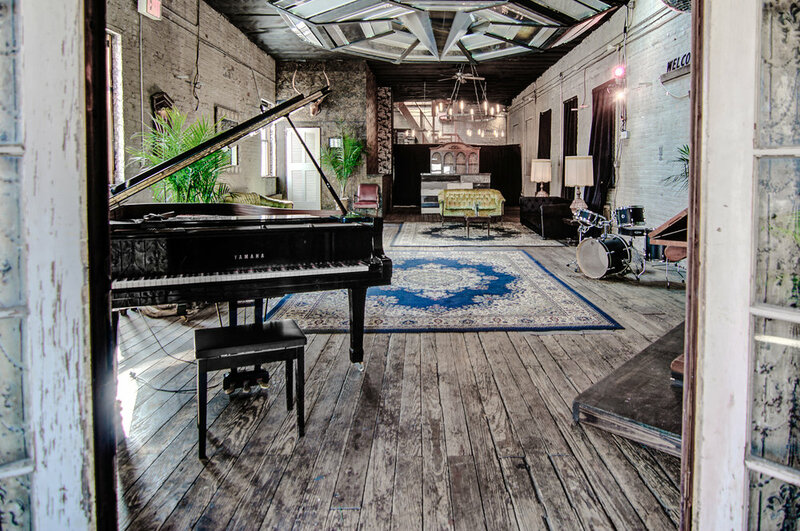 The 2nd floor offers a hand-built interior, custom chandeliers, art, vintage furniture + props, and plenty of character. 13' ceilings, 1,800 sf. roof with 600sf. wooden deck, private bathroom with clawfoot tub, public bathroom with 3 Stalls + 2 urinals.